The Big East’s pathetic attempt to salvage their conference has led them to their latest addition of the University of Memphis for next season (ESPN). While this obviously helps them in regards to basketball (although I’m not entirely sure how you replace Pitt, Syracuse and West Virginia), all it does for football is give me more fuel for my argument that the BCS should drop the Big East’s automatic bid. At this point they might as well just create a special rule that gives Boise State the bid every single year, because there is not a football team in the Big East that will beat them. 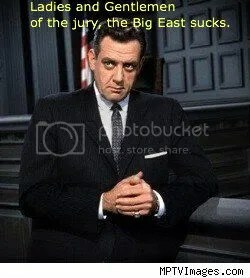 All the Big East is doing is lowering the talent they have in the conference, and for the love of God I wish they would just give up. Taking the best teams from the Conference USA will not make them better or replace the teams they have lost. The truly sad thing is it’s not even the Big East’s fault that they are losing these teams. The blame rests squarely with companies like ESPN and Fox, as well as the BCS. Unfortunately for the Big East, ESPN is too busy mentioning Tim Tebow and counting their stacks to care. This entry was posted in College Football and tagged Automatic Bid, boise state, Conference USA, espn, Pittsburgh, Syracuse, The Big East, tim tebow, university of memphis, West Virginia. Bookmark the permalink. I agree. What was once a great conference for college hoops is now unrecognizable. And for football, you make a good point about the lack of competition. Why would the conferences and ESPN be pushing things this way? Is it just money? In my mind it has to be only for monetary reasons. Each team is chasing to be in the conferences with the best television contracts so their athletic departments can get a bigger cut. This is especially important for smaller schools that don’t have the massive amount of revenue that comes in on game days at schools like Michigan, Alabama, Texas and so on. Because ESPN and other TV networks keep giving out massive contracts to the best conferences other schools want to try and get into those conferences, and then other conferences like the Big East get stuck with the scraps.